9th Level Music is the Publisher of Rex Luciferius the hottest band on SoundCloud with over 20 Million Plays and 3 #1 hits and 20 songs in the TOP 20 CHARTS of SoundCloud in 5 Genres of Music. 9th Level Studios is the Studio Division of 9th Level Music that helps artists create the best sounds possible for their music releases. 9th Level is always looking for New Bands and Artists to work with. The music industry is constantly changing and 9th Level is at the forefront of the Underground and Indy Music movement is changing how Music is recorded and distributed. 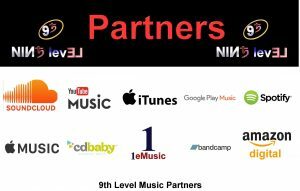 9th Level Music is Partners now with over 150 Digital Music Streamers and Stores. We get our clients heard by millions of music lovers all over the world. Contact 9th Level to help launch your songs world wide.